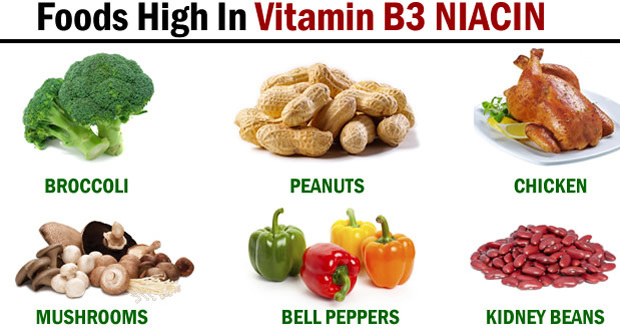 Niacin, also known as Vitamin B3, is important for the normal function of many bodily processes. Like other B vitamins, it is water-soluble and plays a role in turning food into energy, as well as in the metabolism of fats and carbohydrates. Niacin can also act as an antioxidant within cells, which means it can destroy cell-damaging free radicals. In conjunction with riboflavin and pyridoxine, it helps to keep the skin, intestinal tract and nervous system functioning smoothly. The recommended daily allowance (RDA) of niacin for infants under six months is 5 mg. Babies from six months to one year of age require 6 mg. Children need 9 mg at one to three years of age, 12 mg at four to six years, and 13 mg at seven to 10 years. Women need 15 mg from 11-50 years, and 13 mg thereafter. Somewhat more is required for pregnancy (17 mg) and lactation (20 mg). Men require 17 mg from 11-14 years of age, 20 mg from 15-18 years, 19 mg from 19-50 years, and 15 mg at 51 years and older. Niacin in the form of nicotinic acid can be taken in very large doses to decrease blood cholesterol levels and reduce the risk of heart attack. Niacin is an important part of the treatment of familial hyperlipidemia, an inherited disorder characterized by high blood cholesterol levels and increased risk of heart disorders. The amount of niacin required is between 2 and 3 g per day. Although treatment with niacin is considered the best strategy for normalizing blood cholesterol levels as of 2002, it should not be undertaken without professional medical advice and supervision. Niacin has been singled out as a dietary supplement for which people frequently exceed the upper limits of safe intake. One Canadian study found that 47% of adults who were taking dietary supplements were taking niacin above recommended levels. Certain conditions preclude the use of high doses of niacin. These disorders include gout, diabetes, peptic ulcer, liver or kidney disease, and high blood pressure requiring medication. Even in the absence of these conditions, a patient on high doses of niacin should be closely monitored to be sure the therapy is both effective and without complications. A frequent side effect of this therapy is extreme flushing of the face and neck. It is harmless, but can be unpleasant. An alternative form of nicotinic acid that does not cause flushing is inositol hexaniacinate. “Slow release” niacin also causes less flushing, but should not be taken as there is higher risk of liver inflammation. Other conditions that may be benefited by supplemental niacinamide include vertigo, tinnitus, premenstrual syndrome (PMS) headaches, and osteoarthritis. Raynaud’s phenomenon reportedly may be improved by large doses of inositol hexaniacinate. A health care provider should be consulted for these uses. Niacin is not effective for the treatment of schizophrenia. Tuna is one of the best sources of niacin, but many other foods contain the vitamin. Most processed grain products are fortified with niacin, as well as other B vitamins. Although niacin is not destroyed by cooking, it does leach into water, so cooking with minimal liquid best preserves it. The amino acid tryptophan is widely found in foods high in protein, and about half of the tryptophan consumed is used to make niacin. Cottage cheese, milk, fowl, and tuna are some of the foods that are highest in tryptophan. A serious deficiency of niacin causes a condition called pellagra. Once quite common in all countries, it has become rare outside of areas in which poor nutrition is still the norm. Affected groups include refugees displaced by war as well as populations affected by such emergency situations as famine. The symptoms of pellagra include dermatitis, dementia, and diarrhea. Severe niacin deficiency is uncommon in most parts of the world, but some people may need more than the RDA in order to maintain good health. 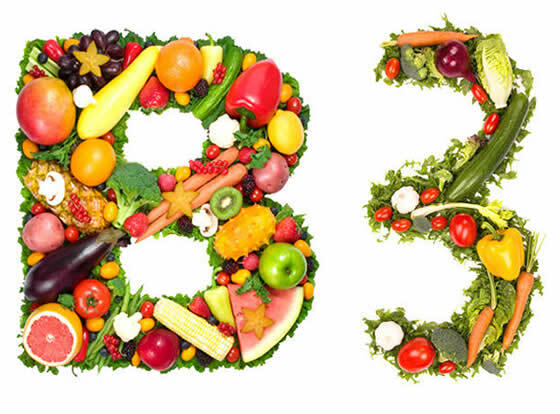 Vegans, and others who do not eat animal protein, should consider taking a balanced B vitamin supplement. Others that may need extra niacin and other B vitamins may include people under high stress, including those experiencing chronic illnesses, liver disease, sprue, or poor nutritional status. People over 55 years old are more likely to have a poor dietary intake. Certain metabolic diseases also increase the requirement for niacin. Those who abuse nicotine, alcohol or other drugs are very frequently deficient in B vitamins, but use of niacin with alcohol can cause seriously low blood pressure. A health care professional can determine if supplementation is appropriate. Niacin should not be taken by anyone with a B vitamin allergy, kidney or liver impairment, severe hypotension, unstable angina, arterial hemorrhage, or coronary artery disease. Supplemental niacin can exacerbate peptic ulcers. Diabetics should use caution as supplements of either niacin or niacinamide can alter medication requirements to control blood glucose. Supplements can raise uric acid levels, and aggravate gout in people with this condition. Pregnant women should not take high doses of niacin, or any supplement, except on the advice of a health care provider. High doses of niacin can cause a harmless but unpleasant flushing sensation as well as darkening of the urine. The “no-flush” form can lessen this complication. Niacin supplements should not be taken by anyone on medication for high blood pressure, due to the potential for hypotension. Isoniazid, a drug used to treat tuberculosis, inhibits the body’s ability to make niacin from tryptophan. Extra niacin may be required. Supplements may also be needed by women taking oral contraceptives. Concomitant use of niacin with statin class drugs to lower cholesterol can cause myopathy. Cholestyramine and cholestipol, older medications to lower cholesterol, should be taken at a different time than niacin or they will reduce its absorption. Transdermal nicotine used with niacin is likely to cause flushing and dizziness. Carbamazepine, an antiseizure medication, is more likely to cause toxicity in combination with niacin.